Do you believe that your human potential is greater than your day-to-day state of being? Do you sometimes experience “weirdness” or “extraordinary moments” that seem to be glimpses into an alternative reality? Good Morning Diego Garcia is a psychological and psychic exploration forged in the chaos of horrendous storms in the Indian Ocean during monsoon season. Following the loss of a child, war in Cyprus, and with growing suspicions that her husband has a secret life, Susan confronts the elements, and evidence that nothing is as it seems. Your marriage is shaky. You survived a war in Cyprus together, and lost everything. Now you’re basically biding time. Good Morning Diego Garcia: A Journey of Discovery, Journeys Book 2 is a non-fiction travel memoir written by Susan Joyce. Joyce and her husband, Charles, were planning on writing a book together detailing their experiences in and escape from Cyprus during the coup and war of 1974. They were currently staying in a rental home in Ojai, California for this new joint project when they received a letter from friends of theirs; Dylan, an English boat captain, and his Israeli girlfriend, Mia. When Susan and Charles knew them, they had been living on a Swedish millionaire’s yacht. 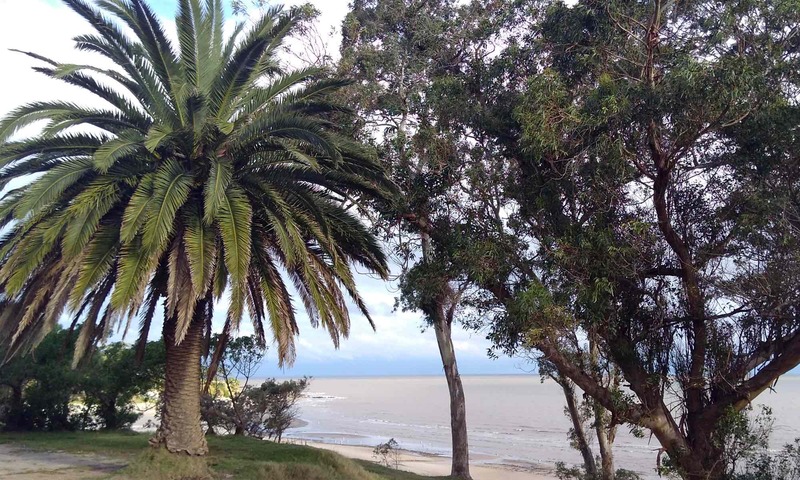 They would be sailing the Swede’s newest sailboat across the Indian Ocean from the tip of Sri Lanka down to Seychelles and then through the Suez Canal, and they invited Susan and Charles to crew with them. It would be an adventure of a lifetime, Charles had thought, but Susan, a non-swimmer, was not quite sure. In any event, they were soon on their way to India, their first port of call. Susan Joyce’s non-fiction travel memoir, Good Morning Diego Garcia: A Journey of Discovery, Journeys Book 2, is such an exciting and eventful tale that I often had to check and see that it was indeed not an adventure novel, but a true story. I enjoyed the author’s detailed accounts of places where she and her husband stayed in India, and found myself getting hungry each time she described the marvelous meals they enjoyed throughout their adventure. The portion of her memoir that deals with the actual voyage across the Indian Ocean is superb. I could see the gigantic swells tossing the sailboat around and the waterspouts appearing in the distance, and I was fascinated by the different ways each of the sailors dealt with the continual battering by the ocean and the ever-present possibility that their boat would sink. Good Morning Diego Garcia is well-written, and the author’s conversational style makes it quite easy to get wrapped up in her tale. It’s highly recommended. Good Morning Diego Garcia: A Journey of Discovery by Susan Joyce is Book 2 in a series of travel memoirs that chronicle her adventure from the US to Sri Lanka, to Bombay, and across the eternity of the ocean, an adventure that curiously led her deeper into the depths of herself. In one of those doodles she makes in the still, quiet hours of the day, she reveals her deepest thoughts and new vistas into her questing soul. Here is one that captures the pulse of her heart, and perhaps, the reason for this book: Collect information! Embrace Unknown! Embrace Uncertainty! 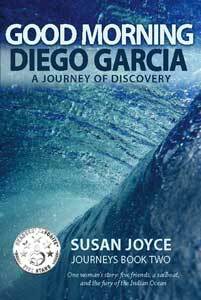 In Good Morning Diego Garcia: A Journey of Discovery, Susan Joyce comes across as a skillful storyteller. Her memoir goes beyond the retelling of a personal story to becoming one of the beautiful social commentaries of her time. Written with simplicity, this book is about courage. The tone can be serious, and at times humorous, but readers will love this book for the author’s candor and honesty, and in the way she opens her heart to readers, revealing a very rich humanity. The dialogue, at every instant, feels honest and natural; the characters are as real and convincing as any non-fictional characters could be.